Absolutely stunning Swarovski 8mm top drilled bicone crystals fashioned into a cluster necklace and Sterling silver findings. Top drilled bicones go all the way round necklace. Made in a selection of colours to suit most dresses. 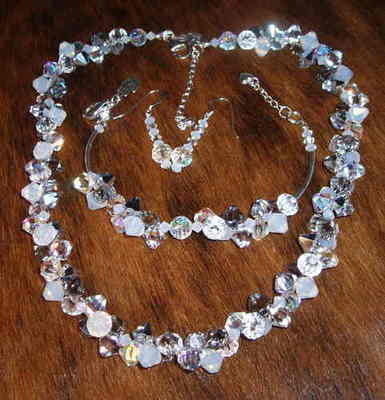 Necklace length 16" to 18" with a 2" extender chain. Earrings 1.25" from top of wire. perfect for the Bride or a lucky Bridesmaid, for the prom, or for a special Anniversary or Birthday gift. Shown in picture with matching bracelet, available to purchase separately.